D. gracilicaule is found from Kiama in eastern New South Wales to the Bloomfield River in the south east of Cape York Peninsula in Queensland. It has one of the widest ranges of habitat of any of our epiphytic orchids, growing in the light coastal scrubs, the dense rainforests and, in the tropical areas, on the tablelands. With such a variation in altitude (from near sea-level to about 1200 metres) it follows that there is a wide variety of hosts, even occasionally growing as a lithophyte on rocks. 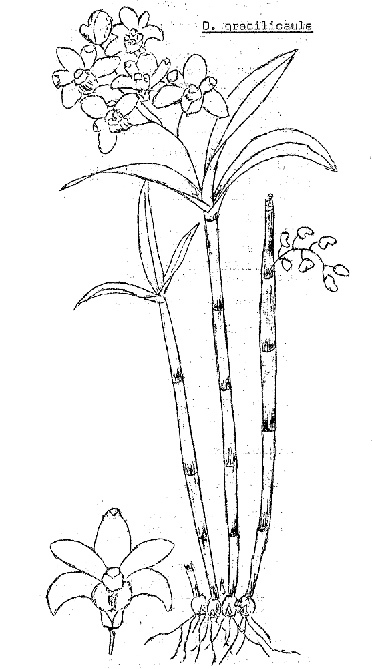 The stems are long, thin and cylindrical, ½ to 1 cm thick, and from 20 to 60 cm in length with 3 to 6 ovate to lanceolate, terminal leaves, 5 to 13 cm long and of rather thin, leathery texture. The racemes are short (5 to 12 cm) and bear 5 to 14 small, cup-shaped flowers of a dull or light yellow colour having the outer sepals lightly to heavily blotched or spotted with a brown or red-brown. Occasionally they are found a brighter yellow and without blotching. The flowering season is from July to September. D. gracilicaule must surely be one of the hardiest and easily cultivated of our Australian epiphytic orchid species as it is adaptable to almost any conditions. I have it growing and flowering on hardwood slabs, paperbark limbs and in a pot, but I think it is better if mounted. It receives 50% – 60% shade and occasional foliar fertiliser. I protect it from frost but the cold does not affect it. It does not flower from first year stems but will flower from mature stems for several years, even after they are leafless. Although most racemes are terminal or near, I have had racemes occurring from nodes halfway along a leafless canes. There are two natural hybrids, i.e. D. x suffusum and D. x gracillimum. D. x gracillimum is a natural hybrid between D. gracilicaule and D. speciosum in which the features of D. gracilicaule are dominant in the flower while in D. x suffusum, the natural hybrid between D. gracilicaule and D. kingianum, D. kingianum is the dominant parent. D. gracilicaule has not attracted professional hybridists, probably because the flowers are not as outstanding as many of our other epiphytes, only two crosses appear to be registered: D. Susan (D. gracilicaule x D. falcorostrum) and D. Shan Leaney (D. gracilicaule x D. gracillimum). This entry was posted in Growing Epiphytes/Lithophytes and tagged Adelaide, Australian orchids, Dendrobium, Dendrobium graciliacaule, epiphytes, Growing Ephiphytes, Native Orchids, orchids, South Australia, Wild Orchid. Bookmark the permalink.